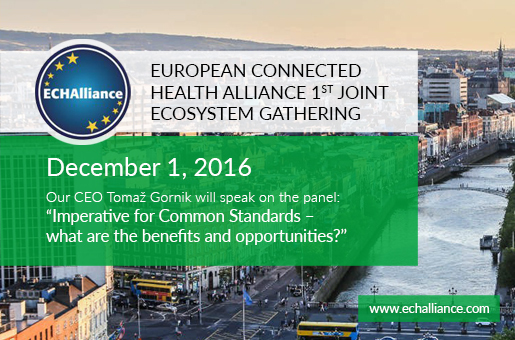 As co-chair of the OpenEHR Foundation, our CEO Tomaž Gornik will be presenting on “Imperative for Common Standards – what are the benefits and opportunities?” at the eHealth Ireland & Northern Ireland 1st Joint Ecosystem Gathering on December 1st 2016. Mr. Gornik will be joined by representatives from IHE and Continua as well as eHealth Ireland and Health & Social Care Board, Northern Ireland, as they tackle the need for common standards across ecosystems. “The panelists will try to share our experience in achieving interoperability among healthcare IT systems in different countries. What is particularly important is that we will be presenting as a team, enforcing the message that openEHR, IHE and Continua can be used together to provide interoperability. Each has it’s role to play: openEHR for modelling and storing structured data, IHE for data exchange and integration and Continua for device connectivity” said Tomaž Gornik, co-chair of openEHR and CEO of Marand. openEHR is and open domain-driven platform for developing flexible e-health systems. As a virtual community working on means of turning health data from the physical form into electronic form and ensuring universal interoperability among all forms of electronic data. The primary focus of its endeavour is on electronic health records (EHR) and related systems. Integrating the Healthcare Enterprise (IHE) is an initiative by healthcare professionals and industry to improve the way computer systems in healthcare share information. IHE promotes the coordinated use of established standards such as DICOM and HL7 to address specific clinical needs in support of optimal patient care. Continua:The Personal Connected Health Alliance (PCHA) is a membership association formed by Continua, mHealth Summit and HIMSS to transform healthcare through personalized, interoperable connected health solutions. We invite you to join the discussion on December 1st, in Newtownabbey, N Ireland.